Learn Mandarin Words and Phrases Online - Taking Photos! Chinese Video Courses >> Beginner Chinese Series 4 >> Let's take some photos! Introduction: Learn to master the use of the ordinal numbers. 李强 和 安娜 在 颐和园。 -bg-Li Qiang and Anna are at the Summer Palace. 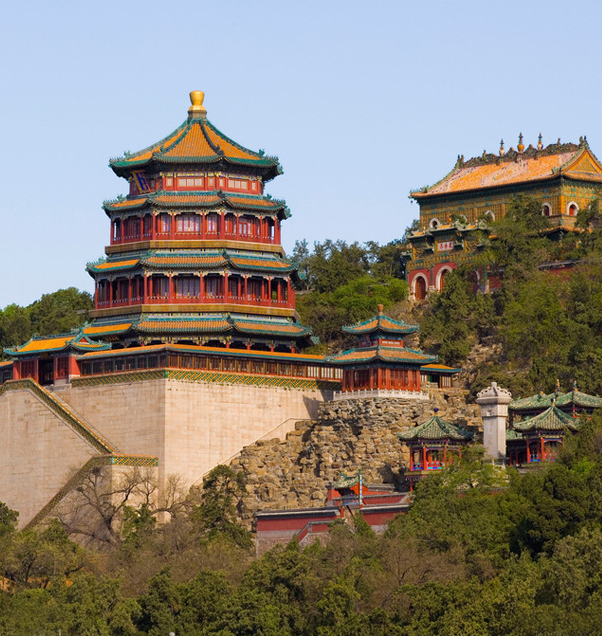 Once you’re in Beijing, it will be a pity if you miss the Summer Palace! The Summer Palace is the largest and the most completely maintained royal garden in China, and is also a world famous tourist attraction. It was built in 1764, and represents the quintessence of Chinese classical architecture, with elements derived from the garden design styles of many different places in Southern and Northern China. The two most important areas of the Summer Palace are Longevity Hill and Kunming Lake. The man-made landscape and the natural hills and water combine beautifully, featuring traditional architecture, courtyards of all sizes, ancient trees and various plant species. Whenever you come to visit, the Summer Palace will always be beautiful. What if you come across a beautiful scenery? You will probably want to take photos and share them with your friends! Learn useful Mandarin Chinese words such as landscape/scenery, take photos and the first time. Thank you. We’re working hard to provide you with better service and are happy that the format is working for you. We don’t teach English, only Chinese. Cheers!